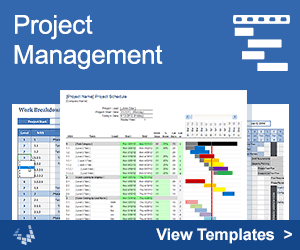 Although you can find specialized employee scheduling software, sometimes you just need the flexibility of a simple spreadsheet. I created this new Employee Schedule Template for a hospital that has a 12-hour day and night shift, with nurses who may be full time or part time. It lets you list any number of employees and counts the number of employees working each day to help you set up a working schedule. See below for more information about how to use the Employee Schedule Template in practice. This employee shift scheduling template helps you create a 4 or 6-week schedule for any number of employees. It uses a separate table for day and night shifts. Add an "X" into a cell to indicate what days a person is going to work. The whole point of this template is to make it easy for you to create a very flexible employee schedule. 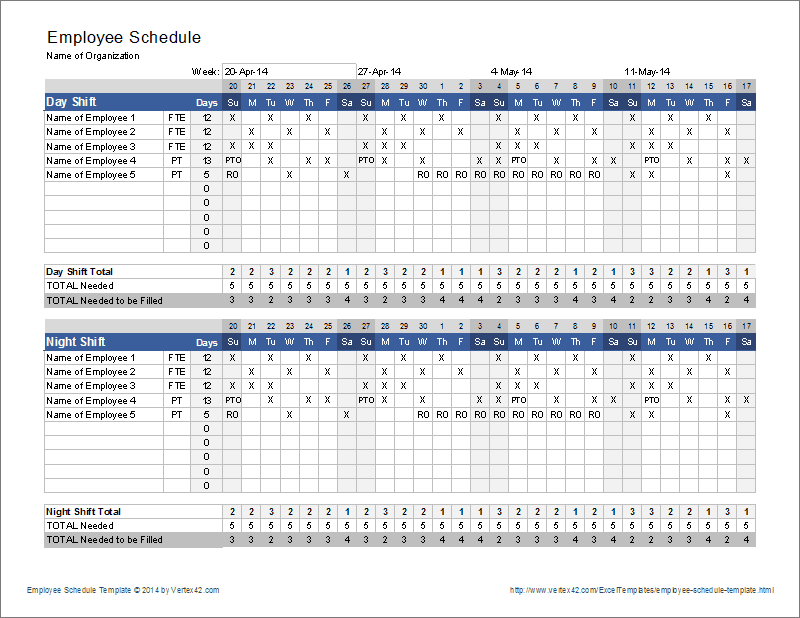 The Total row(s) and the Days column count the number of X's so that you can easily tell how many people are working each day as well as how many days each person is working. You can put whatever codes you want into other cells as notes about people taking time off, availability for on-call, etc. Only the X's are counted. You can change the background colors to highlight different weekend days if you want to. To create a 6-week employee schedule instead of a 4-week schedule, just unhide the columns to the right of the table. After printing a blank schedule, you can have each person fill in by hand what days they want to work, which days they specically need off, vacation days, etc. You could also share a draft copy of the spreadsheet to have each person fill it out online, but that may depend on your employees (and their computer skills). Some people try to use software to automate the creation of the schedule, but sometimes it's just easier to use your own brain, especially when there are considerations you need to factor in that a computer can't automate. Print it out or create a PDF. In Excel 2010+, you can create a PDF by going to File > Save As and choosing PDF.